No matter the occasion, the Smoky Mountains are a great destination for any gathering. Even better, 5 bedroom cabins in Gatlinburg, TN can make your stay both comfortable and relaxing! Whether you are part of a conference, a family reunion, or just a group of friends exploring the Smokies, these rentals can comfortably sleep as many as 20 guests! At any time of year, there is a lot happening in the Smoky Mountains. Thanks to excellent convention center facilities, many organizations and groups choose the Smokies for conferences. Our 5 bedroom cabin rentals in Gatlinburg are perfect for groups attending major events. Whether you are participating in a local conference or your family is hoping to attend huge gatherings like Rod Run, these cabins keep you near the action. Guarantee that your family or group can enjoy their stay with a comfortable Gatlinburg cabin! For family gatherings of every sort, we recommend exploring our group cabins in Gatlinburg, TN. Ensure that your whole group, young and old, finds something to enjoy about their Smoky Mountain cabin vacation! With outstanding cabin conveniences like pool access and hot tubs, it can be easy to overlook these practical amenities. Features like our fully equipped kitchens and washer/dryers surely make your stay in the Smokies even more comfortable. Being able to cook meals for your group and keep the kids clothes clean can cut down on your vacation stress. On top of these in-cabin amenities, you may also find a cabin with a theater room or game room. These rooms are a favorite of groups with children since they provide the kids a place to play so the adults can unwind. 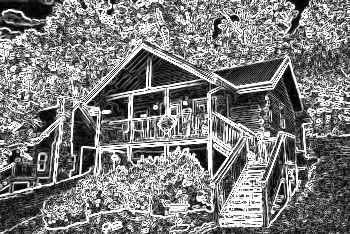 With convenient locations, you can be sure that your 5 bedroom cabin in Gatlinburg saves you time and money. By keeping you close to the attractions that your group wants to see, you can spend more time exploring the Great Smoky Mountains National Park. Our cabins near Dollywood are especially popular since families love to stay close to the famous theme park. These spacious cabins in Gatlinburg are convenient for enjoying long days at Dollywood or playing on the Pigeon Forge Parkway. Once you choose your ideal cabin, remember that you will receive a 15% discount for online bookings! We offer a great selection of cabin options ranging from 1 to 8 bedrooms. If you require something smaller than our five bedroom cabins in Gatlinburg, we offer 4 bedroom Gatlinburg cabin rentals. Likewise, if you require a larger cabin for your stay, we offer six bedroom cabin rentals in Gatlinburg, TN. Remember to book online and receive your 15% discount for staying with Cabins USA Gatlinburg!